If You’re a Monster and you Know It by Rebecca Emberley: To kick off Monster Week, we read “If You’re a Monster and You Know It”. It’s a super fun book that you can easily add actions to. The scholastic website has the song form of the book available for download for free. R enjoyed listening to it off of the computer and doing the actions with me. We listened to the recording all week and R would always stop to dance along and do the actions with me. Her favourite part was wiggling her warts (we’d scrunch our nose up and wiggle it). R really enjoyed the texture of the slime or oobleck I made for her. 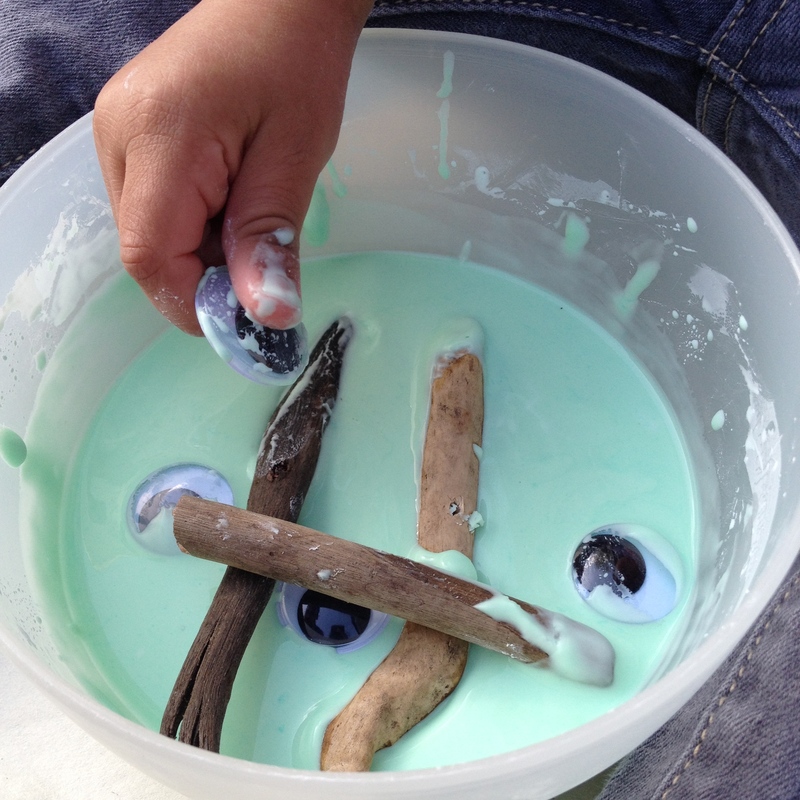 It was made with 2 parts cornstarch 1 part water plus some drops of green and blue food colouring. The slime is hard when you press it, but will pour out of your hands. 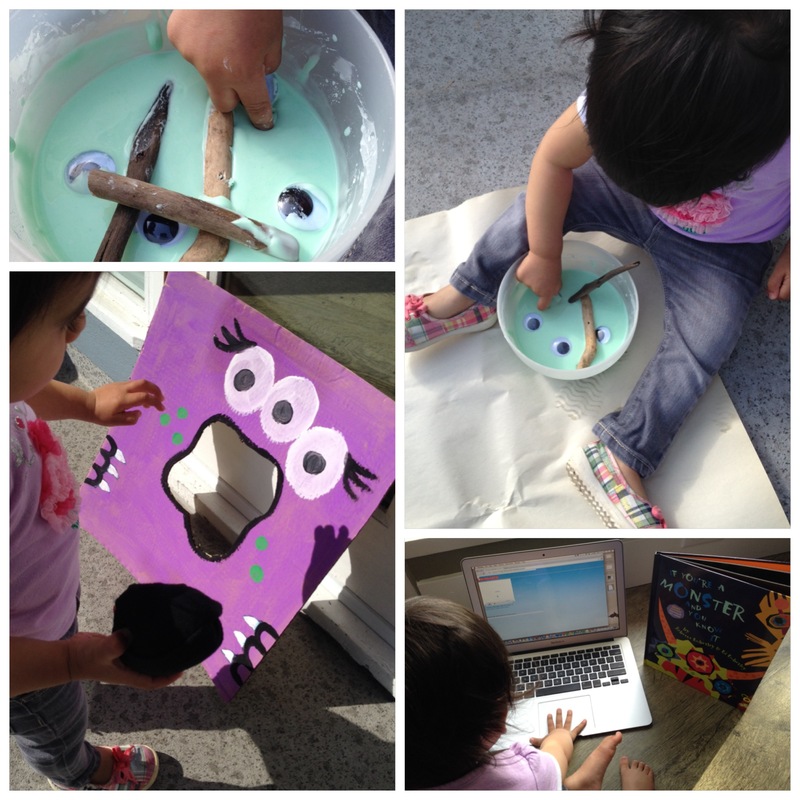 I added sticks and big googley eyes as “monster” components to R’s invitation to play. She enjoyed digging at the slime and poking it with her finMy husband and I had a lot of fun playing along with her! a. Use this slime recipe to discuss non-Neutonian liquids and how it demonstrates both the properties of a solid and a liquid. I cut a hole in a piece of cardboard and painted on a monster face. For the bean bags, I put rice into a small ziplock bag and then put the bag into a sock and rolled it into a ball. We did this activity to get R to practice throwing forward. She has made huge improvements in her ability to throw forward, but still continues to be much more successful at throwing backwards! My husband and I played along with R and she thought it was absolutely hilarious when the bean bag hit the monster. She laughed so hard; it was just adorable! Sometimes she threw the bean bag, and other times, she daintily placed the bean bag right into the monster’s mouth! a. 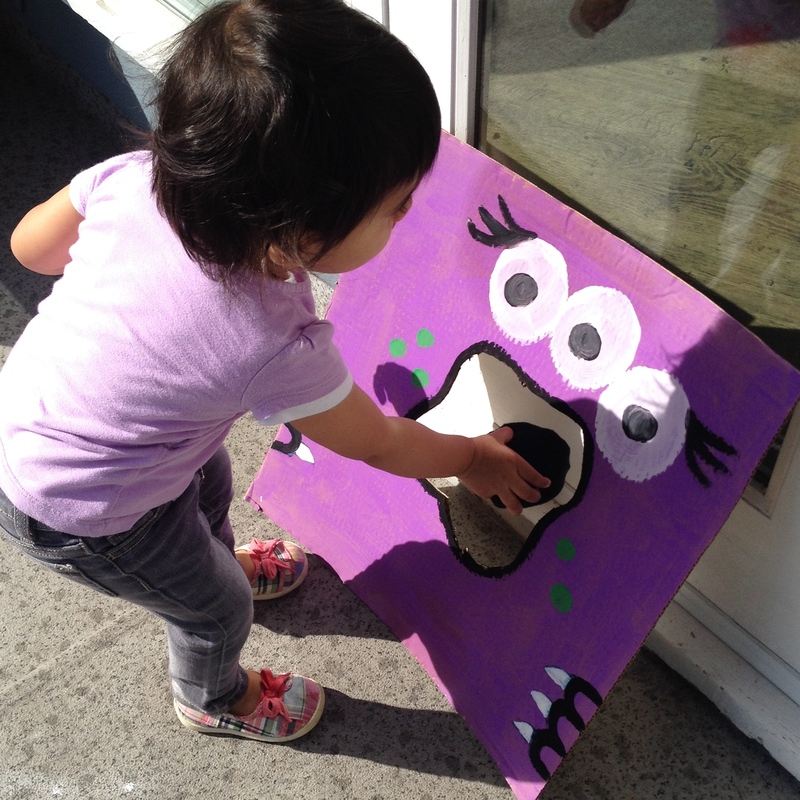 Have the child slowly move further and further back as s/he attempts to toss the bean bag into the monster’s mouth. b. Add to the challenge by placing the monster at different heights before tossing the bean bag.